Jack-up barges operate in the most demanding marine environments, including heavy seas, strong currents and large tidal ranges that make marine projects dangerous, if not impossible, when using conventional floating platform. 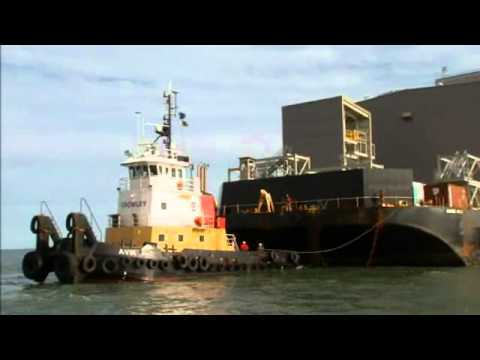 The KARLISSA A and KARLISSA B jack-up barges have overcome some of the harshest operating environments to provide solutions for our clients around the world. Our jack-ups have a combined total of 1,880 meters of clear deck space and the ability to jack in depths of up to 50 meters. From the treacherous wreck removal of the NEW CARISSA — located in the surf zone outside of Coos Bay, Oregon — to the historic lifting of the H.L. HUNLEY, TITAN has the equipment and expertise to overcome virtually any hurdle. BOWSTRING – This 49-meter survey vessel sunk in the St. Johns River in Jacksonville, Florida. KARLISSA A, under contract by the USCG, utilized two TITAN pullers, skid frames and chain fairleads off her bow. HUNLEY – A Confederate submarine sank in 1864, off the exposed coast of South Carolina. KARLISSA B installed suction piles and custom built truss before raising the HUNLEY and the remains of her crew from the seabed, where she had resided for over 136 years.